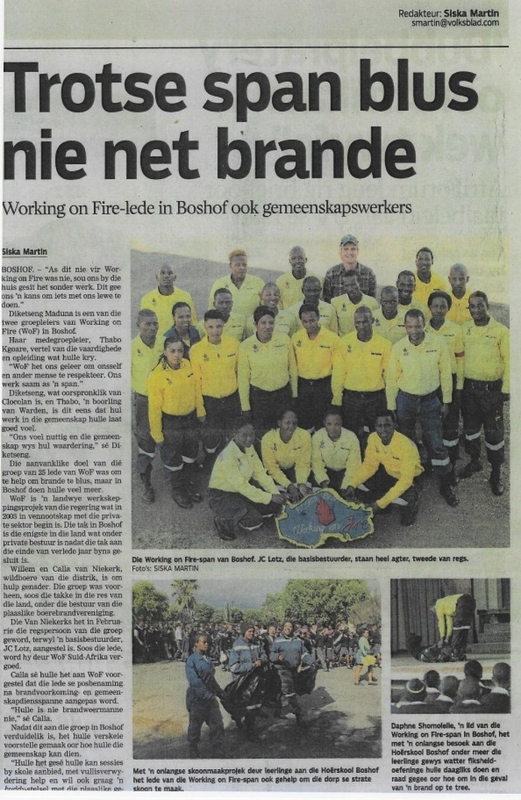 Buffelcor Langkop Boerdery proudly partnering St.John’s Boy’s College in major Boshof Community projects. The goal for the project is to create sustainable income for the members of the co-operative and for the revenues to trickle down to the greater community. 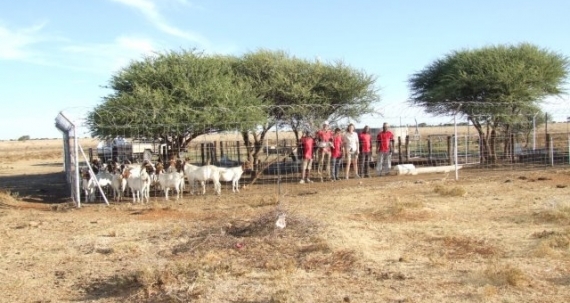 In 2010 funds were allocated for purchasing of 42 high quality goat ewes and one stud ram. Due to mismanagement of funds, all stock delivered were in a very poor state as they arrived in Boshof in September 2010. The goats were allocated to graze on the municipal land. Boshof is located in a very dry region of the Free State, September being one of the driest months. Year 2010 delivered very little rain and the region suffered from a severe drought. As a result, 16 of the ewes and all offspring died of malnutrition within a year of their arrival. Of the twelve founding members, only 5 co-operative associates remained active and took interest in the well-being of the livestock. Towards the end of 2011, the Agricultural Advisor of Boshof requested Calla van Niekerk to get involved in the project and to act as a mentor for the co-operative. She agreed to act as a volunteer mentor, and as such isn’t paid for her assistance. As the stock were in a poor state and producing no offspring, the poor quality ram was sold and a younger breeding ram purchased from the Karoo. The remaining active and committed co-operative members (Johannes Bonokwane, George Raad, Lukas Moleme, Angus Mamogo, Antoon Witters) with their immediate families are the direct beneficiaries of the project. Of the seven non-active members two have recently handed in their resignation from the project. According to the constitution of the co-operative, 20% of the profit made is retained for the petty cash kitty for the following year – this funds the purchasing of supplements, veterinary products etc. Year 2013 will be the first year when the project will have made a profit and funds can be divided between the co-operative members. “In the beginning there were twelve of us in the co-operative. The objective of the project was misunderstood by some and soon there were only five active members who tended to the goats. All five of us have our own commitments, be it employment or our own business set-ups. 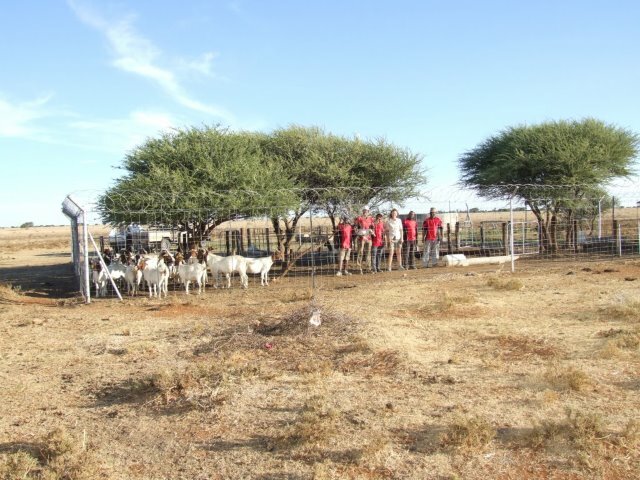 Therefore, we take turns in looking after the goats, and every evening the goats are brought back into the kraal for safety and in the morning released back into grazing. Our main issue is lack of quality grazing. The goats graze on the municipality land, which is not in good condition. There is a lot of illegal grazing there and that leads to the veld being overgrazed. The municipality should control who can graze their livestock and where. This is why we’d like to request the State to assist us with some winter feed, perhaps lucerne to keep the goats in good condition when grazing is at its poorest. Also the fencing is in very poor state and needs fixing. Our goats roam into the neighboring farms frequently and this causes problems. In the summer getting adequate water is an issue. We have approached the Department of Water Affairs, Northern Cape and they have promised us assistance, after their budget meetings in September 2013. In the beginning of the project, we were supplied a kraal and a shelter for the goats as well as a once-off supply of some feed. The kraal and the shelter are still in very good condition. I would suggest that in the future, the State arranges a follow-up protocol for similar projects. Someone should be checking to see if the project is working out. Financial assistance for day-to-day expenses is paramount, because before the project starts turning a profit, people from low-income households struggle to find the money to pay for veterinary products, feed supplements and other necessary items. Many of these projects fail because although money is given to kick-start the initiative but after that there is no support. Distribution of the funds and material assistance should be reviewed, as a lot of the items end up in wrong hands or never get delivered to their intended destination. The members of the project should be told what the State has allocated to the project so they know what to expect to arrive. Good quality grazing poses a challenge in the Boshof area which is prone to severe droughts. The municipality land appointed to the goat project is of a very poor grazing quality. The fencing in the municipality camps is in a state of disrepair. Due to lack of grazing in the municipality camps and the poor state of fencing, the goats wander on to neighboring farms. This causes friction between the co-operative and the farmers, who safeguard grazing on their farms for their own livestock. It is of utmost importance that the fencing is repaired in order to avoid animosity. Cold winters in the area are tough on small lambs, and there are small predators in the vicinity. Educating the co-operative members about basic business practices, standard accounting procedures, handling of finances and the importance of transparency and keeping a paper trail has demanded a lot of the mentor’s focus and time. Female breeding stock has slowly climbed back up to 36 ewes, and the aim is to increase the number to 40 ewes. The herd currently includes 16 strong lambs, of which ten to twelve individuals will be sold by the end of 2013. Due to challenges with grazing, the size of the herd can’t be increased much higher than 40 ewes. In order to ensure that the active members of the co-operative are rewarded with an optimal income from the project, it is essential that the 40 head strong herd is managed well, kept healthy and of good quality. Repairing of the fencing on the municipal land is urgent and the surrounding farmers have offered to provide the manpower to do the fencing as long as the State provides fencing material. Mr. Madiba has been of great assistance during the course of the project and therefore he has been requested to provide help with acquiring of the fencing material. 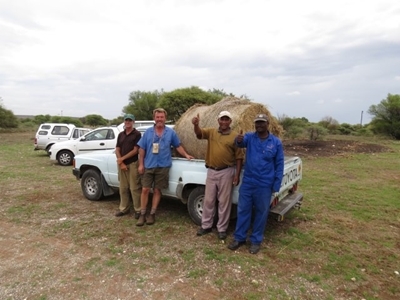 The Bokomoso Goat Project is the only remaining State funded BEE project still operating in the Boshof area. All other initiatives were unsuccessful and therefore shut down. Bokomoso is now generating revenue and empowering its members. 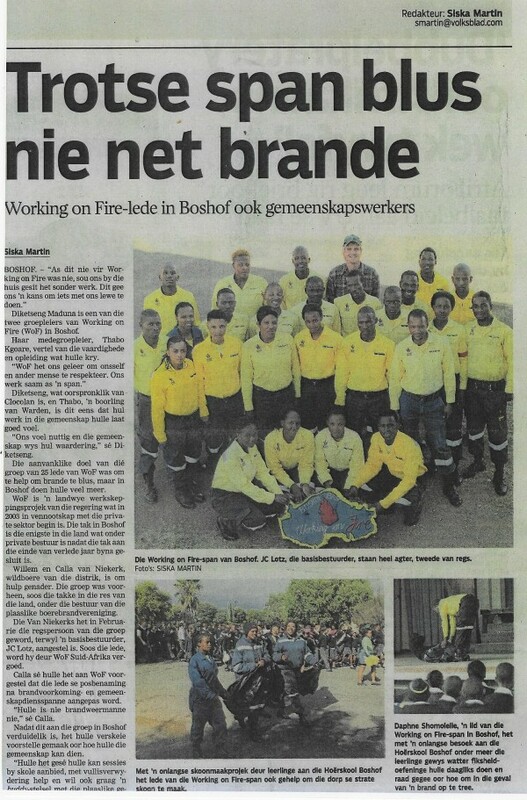 Article about the Working on Fire initiative in Boshof. Februarie 2015 and is under private management. The current base manager for the project is JC Lotz. but is actively involved in community support-activities. Buffelcor Langkop Boerdery is a supporter of Broad-Based Black Economic Empowerment.